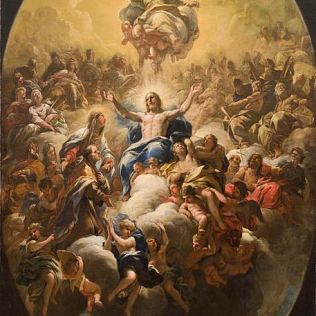 The painting The Glory of Saint Andrew Corsini, by Luca Giordano (1634 - 1705), the Neapolitan painter who worked in Italy and Spain, was considered lost. In Florence, Luca also worked at the frescoes of Palazzo Medici-Riccardi. The painting is dated 1682, and the researchers considered it dispersed, until some time ago. The Roman gallery owners Antonacci and Lapiccirella - through an historical and bibliographic research - found the painting, owned by a branch of the Corsini family. The Glory of Saint Andrew Corsini, in fact, is a try for painting the frescoes of the noble family chapel in the church of Santa Maria del Carmine in Florence. After retrieving the work, the gallery owners have contacted the Uffizi Gallery, which bought him. A newcomer enriches the Uffizi collection.